Updated BOARD MEETING Information for DDA/Main St. Please note that effective with its January, 2018, the location of the Three Rivers DDA/Main Street’s monthly board meeting will change permanently to the conference room at our office location, 57 North Main Street, at the corner of Portage and Main in downtown Three Rivers. The board felt it an appropriate move to be closer to the focus of our work. Meanwhile, our December meeting has been rescheduled from 12/1/17 to Friday, 12/8/17 in order to accommodate several members’ schedule conflicts and ensure that we have quorum. Due to the availability of space at this off-schedule time, the meeting will take place just across the street from our office, in the main, street-level floor of #52 North Main Street. The TWELVE COCKTAILS OF CHRISTMAS are here! We hope to see you on Main Street in downtown Three Rivers! BACK UP and RUNNING with CHRISTMAS INFO! Please pardon us – we lost our access to edit the page for a few days during a critical time last week: the days leading up to Christmas Around Town! If you were looking for information on the event this past weekend, we hope you were able to find it on our Facebook page, on the radio stations WLKM and WRCI, or in the Three Rivers Commercial-News. We worked through it with our techies, are now back up and running. The good news is that the event was a great success, with more than 500 people in the Santa line on Saturday, nearly ten great holiday activities, and a busy, vibrant Main Street! We thank our sponsors, including revitalization partners American Axle & Manufacturing, Armstrong International, and the Three Rivers Area Community Foundation, as well as event sponsor Southern Michigan Bank and Trust, the merchants of our great downtown, and all of the many volunteers who came out from the DDA and NHS to make this event a success! If you have any questions about the upcoming, Friday evening Main Street Holiday Strolls in Downtown Three Rivers throughout December, we will be updating this page with information on those very shortly. For now, we’re attaching the Christmas Around Town program (see below), which includes information on what the Friday night themes, dates, and times will be. HarmonyFest 2017 is almost here! As it has in recent years, the show starts at 1:00 pm on Sunday, September 3rd – that’s Labor Day weekend – in the first block of North Main Street in Downtown Three Rivers. Ample parking is available in lots surrounding downtown. The event is free and open to everyone! The beer garden is also back again, starting at 3:00 pm. With the opening of our new brewery in downtown Three Rivers, the Kelsey Block Brewing Company, we’ll be emphasizing local products from there, Corey Lake Orchards, and Constantine Brewing. As always, kids fest will be loaded with fun activities as well, and will be open and available from 1:00 to 4:00. Lastly, if you’d like to volunteer at this year’s event, we have a variety of options, from setup, to selling tee shirts and working the crowd, to helping ensure this year’s beer garden is another great success. Email us by clicking here and let us know a little bit more about you, your interest, and your availability – we’ll get you plugged in. If you can’t volunteer, we also welcome event contributions and sponsorships – just contact us and let us know you are interested. No matter what, we look forward to seeing you at this year’s show! Our ever-popular ladies’ night on the town, Sass in the City, is fast approaching on Friday evening, August 4th, 2017, and we’ve got a full program of activities! See the program listing below, or visit the Sass in the City Facebook Page for the latest on what’s happening! Veterans Family Night: Join us for our Next First Friday! 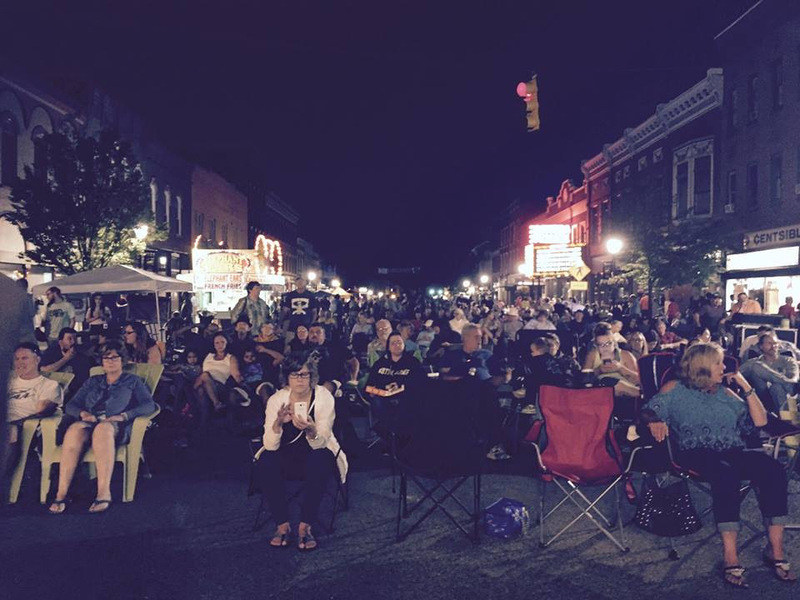 If you caught our First Friday event for June, our Downtown Three Rivers Ice Cream social, you caught a great night with great energy on our Main Street! More than 200 people of all ages came out to see downtown on a warm, sunny, summer evening and partake of free ice cream and toppings courtesy of our business owners in downtown. This Friday, we’re offering a gentle, low-key, family-friendly celebration in honor of the men and women who have served our country. Offerings include free dinners, desserts, and giveaways for veterans who show credentials, and sidewalk chalk drawing and special displays for the whole family. The event is open to all – we look forward to seeing you in Downtown Three Rivers! Contact the Three Rivers DDA/Main Street at 269-535-5145 for any questions. 51 North Main Street, Unit A (upstairs), in Three Rivers. Main Street Happenings Spring 2017! KELSEY BLOCK BREWERY! On Saturday, March 18, the Kelsey Block Brewing Company opened to the public for the first time! We were excited to be there, and you can check the Downtown Three Rivers Facebook page for a short video. The beer is fantastic, the building is nicely renovated, and owner Jerry Barkley is pleased to offer a selection of great homemade snacks. Stay tuned; he’ll be offering a more complete menu for your dining enjoyment once he’s had the place open for a few months. Current hours are Fri-Sat-Sun, 4-10. Come down and check the place out! ROOSTER’S WING SHACK: At its March board meeting, the DDA/Main Street awarded Sean Reus a $20,000 grant for rehabilitation of the former Paisano’s property, and we are excited about the changes. Newly-uncovered and refinished hardwood floors, tables made from recycled bowling alley and black pipe, corrugated metal trim, and new lighting will give the place a trendy, new feel, while new kitchen and tap equipment, a new bar (back near where it was when Paisano’s opened), and an expanded set of taps will allow for a better focus on quality, with Michigan-brewed selections. Fewer pool tables and a brighter space mean a more family-friendly atmosphere. Best of all, look for a wide selection of flavored wings and many other items. We’ll be excited to see afternoon and evening dining options return to the block – expect an opening in late spring! LANDMARK TAPHOUSE: The project to renovate the former Pub 21 property into a trendy tap house and restaurant continues to move forward. Notice a theme yet? We’re on our way to being able to claim Three Rivers as a destination for micro brew aficionados and people seeking to try new experiences in local eateries. This project is being funded from a variety of sources, so there are a lot of details to be ironed out before work is permitted to start, but funders, contractors, and the property owners recently met to begin the first steps of moving toward construction. DDA, the city, MEDC, and others are all at the table, and the Russells have shown steadfast commitment to moving forward. This is a big project, and we anticipate great things. We’ll keep you posted as they develop! CLEANUP DAY: Our annual cleanup day is approaching! Join in the fun as we spruce up downtown Three Rivers and get ready for summer with flower planting, painting, trimming, and many other tasks. Spend a spring day outside with your fellow citizens helping take pride in our great city! Stay tuned for more details – the event takes place on Saturday, May 13 – and email [email protected] if you’d like to be involved! FIRST FRIDAYS! Our downtown merchants and our Promotions Committee have decided to undertake a First Fridays downtown events series! With the brewery open now, the Wing Shack open soon, and an exciting list of entertainment and events to be revealed, we expect these to be great fun! The first, kickoff Friday will be June 2 from 5 to 8 pm, and will be an Ice Cream Social; each Friday will have its own unique theme and activities. Keep an eye on the Downtown Three Rivers Facebook page and trdda.net for the latest! VOLUNTEER PICNIC: Coinciding with our inaugural First Friday on June 2, we’ll also host a volunteer appreciation picnic in Scidmore Park. We’ll grill hotdogs, and you may choose to bring an optional potluck item as we pay tribute to the many hardworking volunteers who keep our program rolling forward. We’ll adjourn to the Ice Cream Social afterwards – email [email protected] to RSVP! MOVING TOWARD COHESION: In February, national and state Main Street staff joined our board, staff, and supporters to identify next strategies for moving forward. With our events, our grant programs, and other activities, we’ve achieved some great progress – more businesses and prospective business owners are taking a serious look at our downtown. The goal of this meeting was to identify a way to move us to the next level of achievement. After looking at our best assets and strengths – our history museums, the Carnegie and the Riv, HarmonyFest and other events, the Artists’ Guild, our artisan merchants, and the rivers and parks – it became obvious that we have the beginnings of an arts, culture, and entertainment district here. Now, we’re having some initial conversations with those organizations and businesses to look at ways to put our strengths together, add more acitivites, and highlight what we already do well, so that in a few years, Three Rivers might be able to attract visitation on the basis of the unique and great things we have to offer! …our coming restaurants should help, too. We’ll look to further showing off our outdoor opportunities – rivers and trails – further down the road as the related infrastructure falls into place. GOLDEN FINCH FRAME: Many of you have been watching the Golden Finch Frame and Gallery in anticipation of their move. In keeping with our new arts-related theme, owner Nancy Boyce has decided to keep the store in its current location at Main and Portage. We’re glad she’ll be staying here in downtown, and that her store will be an important part of setting our identity going forward! 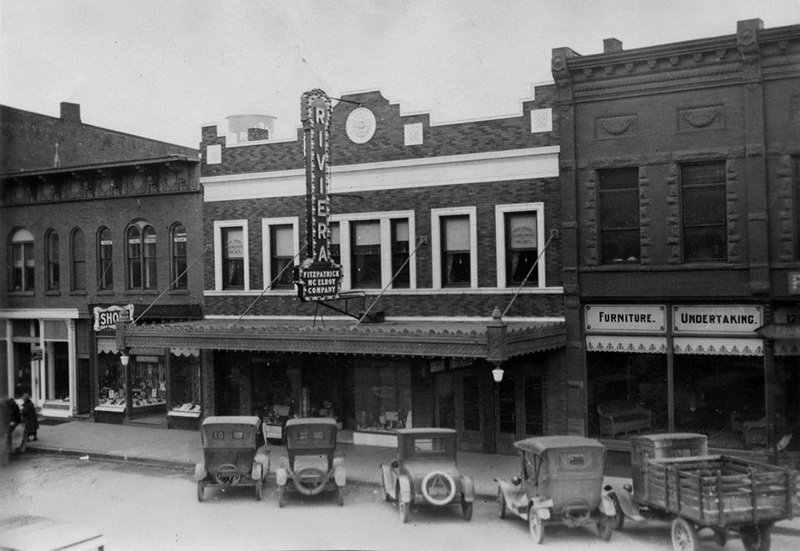 Three Rivers people once flocked to downtown for its arts and entertainment. The Riviera is still with us as a great place to spend time, and with a new brewery and more restaurants coming soon, we expect Downtown to thrive again! Our downtown is filled with creative people, like Misty Vosters of Yummy Creations by Misty. 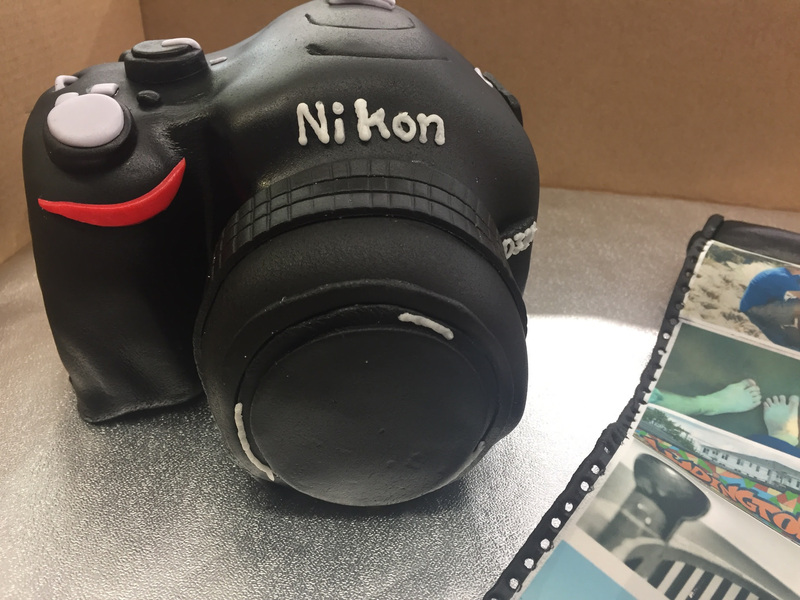 Would you believe that this camera is a cake? 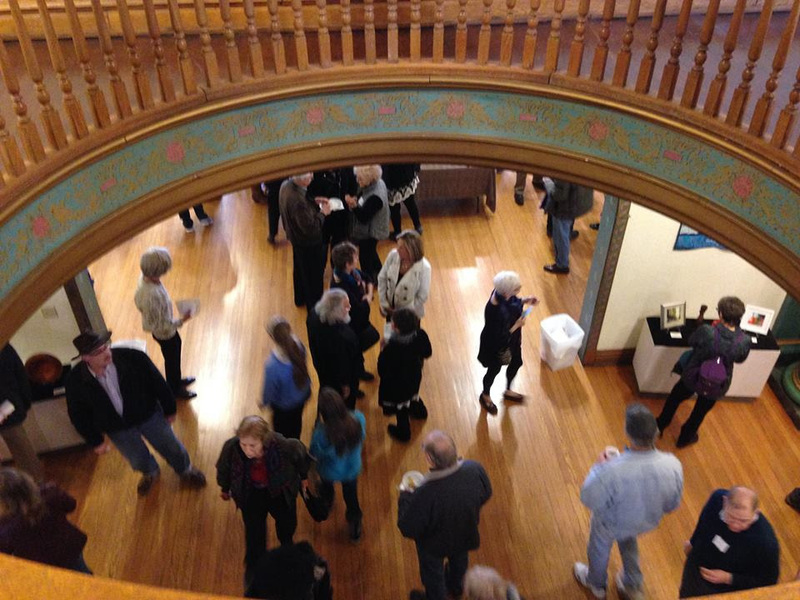 The Carnegie Center for the Arts and the Three Rivers Artists’ Guild bring our community’s talent together. TR Artists’ Guild photo. 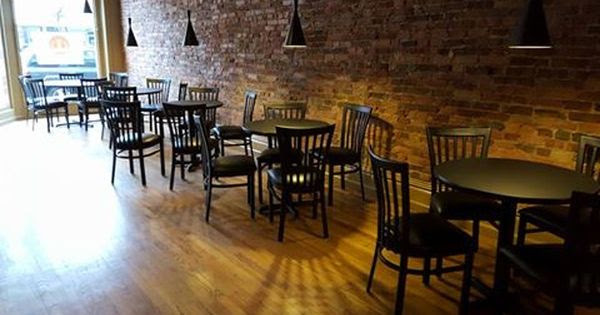 The new Kelsey Block Brewing Company has been open since mid-March, and it’s a beautiful space. We think you’ll agree–and we think the beer is great, too! We’re a factory town, so we’ve always been good at making things. This Chevy may well contain Three Rivers parts – but we also make art in many other forms! 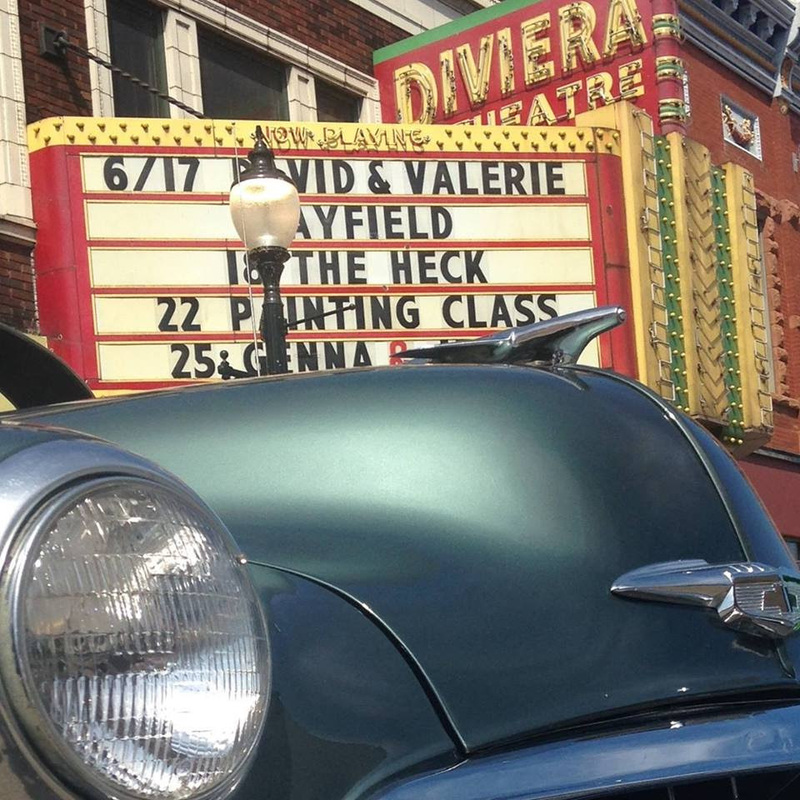 From HarmonyFest to Elvis-impersonator shows at the Riviera Theater, live entertainment brings people to our downtown! 4/22/17: TRACF SPLASH EVENT – Three Rivers Area Community Foundation will hold its casino night fundraiser at A Place in Time on Saturday evening, and our DDA/Main Street will be there to help celebrate their successes. 6/2/17: FIRST FRIDAYS KICKOFF ICE CREAM SOCIAL: The first of our First Fridays downtown events series will be an ice cream social in downtown Three Rivers, to be held the first Friday of every month from 5 to 8 pm. 6/2/17: VOLUNTEER PICNIC: As part of our inaugural First Friday, we’ll host a volunteer appreciation potluck picnic in Scidmore Park. 8/4/17: FIRST FRIDAY – SASS IN THE CITY! 9/8/17: TR SCHOOL PRIDE! In lieu of a regular First Friday, our downtown merchants will celebrate our city’s school pride in honor of Homecoming on the second Friday of September. FALL ’17: Stay tuned for the fall when our program will host its first annual signature fundraising event, our First Fridays will continue, and Christmas Around Town festivities will start in late November! Copyright © 2017 Three Rivers DDA/Main Street, All rights reserved. Any interested person may attend and participate or submit written comments to the City Clerk at the address above. The property tax millage rate proposed to be levied to support the proposed budget will be a subject of this hearing, including a possible adjustment of the Tax Increment Finance capture to the full legal allotment of two mills. The Downtown Development Authority of the City of Three Rivers will conduct a Special Meeting of the Board of Directors on Friday, March 24, 2017, at 3:15 pm at the Three Rivers Chamber of Commerce conference room, 57 North Main Street, in Three Rivers. The purpose will be to discuss preparations for a budget hearing for the Fiscal Year 2017-2018 for said Downtown Development Authority, to take place at a subsequent date.